WASHINGTON — Leadership from two prominent veterans groups on Monday blasted White House officials for “disrespect” in their response to the death of former Arizona Sen. John McCain, insisting the Navy veteran deserved more national recognition. 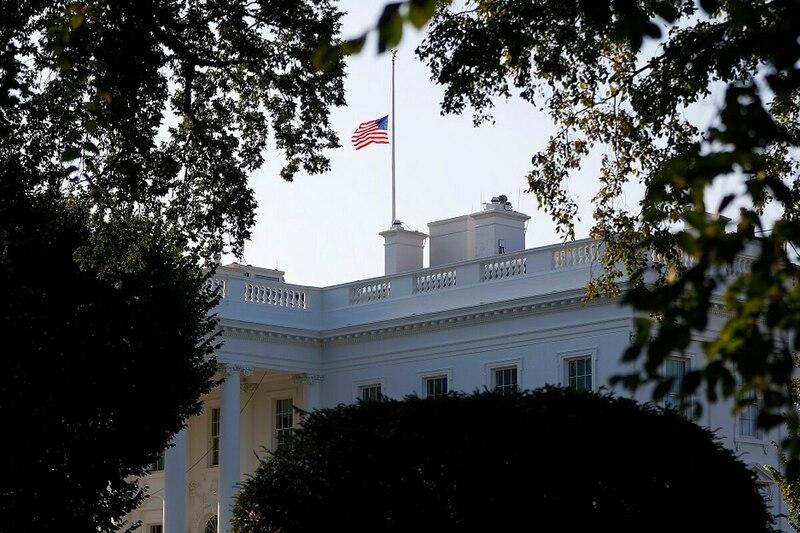 At issue is a decision by the president and his staff not to keep flags flying at half-staff for this week, leading up to McCain’s funeral on Saturday. McCain, arguably the best-known veteran in America, died after a lengthy battle with brain cancer on Saturday, Aug. 25. Flags at national buildings were lowered when McCain’s death was announced but raised just two days later on Monday morning, bucking a tradition of honoring well-known members of Congress for longer periods of time. AMVETS officials said McCain — “a war hero, twice a presidential contender, and a national treasure who devoted his entire adult life to protecting and improving the American way of life” — deserved more. "It’s outrageous that the White House would mark American hero John McCain’s death with a two-sentence tweet, making no mention of his heroic and inspiring life,” Joe Chenelly, AMVETS national executive director, said in a statement. Similarly, American Legion National Commander Denise Rohan urged Trump to order the flags lowered through the week. McCain and Trump sparred frequently and openly in recent years, beginning when Trump during his election campaign mocked the Vietnam War veteran’s status as a war hero. Trump did not apologize for those comments, even after numerous veterans groups called them insensitive and offensive. In the years since, McCain has criticized a host of Trump’s national security policies, including his handling of relations with Russia. Several news agencies reported that McCain asked his family not to invite Trump to his funeral, which is scheduled for Saturday in Washington. The group is also one of several supporting a proposal to rename the Russell Senate Office Building in honor of McCain.